Volvo vehicles are known for their top notch safety features and the company’s trucks share the same attributes. The 44 tones FH is the biggest truck in Volvo’s lineup and has a long and successful history behind it. In 2010 the FH range received a few upgrades to keep the model on the top of the sales charts. In order to offer a high level of versatility, the FH is available in various versions of trims and cabs. The FH is also equipped with strong and efficient engines with a power output range between 420-540 hp. The Volvo FH comes in rigid or tractor configuration and is available with four cab designs including Day Cab, Sleeper cab, Globetrotter Cab and Globe Trotter XL Cab. Volvo had always a more conservative approach regarding the design department and the FH makes no exception. With a cab on engine configuration, the truck has a clean and robust design which copes well with its heavy duty character. The rectangular front grille is traversed by a chromed diagonal strip and bares the company’s logo in its center giving the truck a studious face. Our favorite details are the raked screen and the low placed vertical headlights, as their sharp design ads a touch of sportiness to the entire truck. The overall appearance of the FH is more subdued and mature than the imposing look of the Mercedes Actros or Scania R Series. While we like the impressive design of its two rivals, customers choose heavy-duty trucks because of their capability and the aesthetic decisions tend to be secondary. Luckily, every heavy-duty truck available on the market offers fabulous performances, but Volvos remain among the most reliable trucks in the business. Climbing aboard, you’ll find one of the best cabins in the segment. The materials and the build quality are at a premium level and the FH can even be compared with the Mercedes Actros. We also love the wrap around design of the dashboard which is similar with the one from the Renault Magnum. 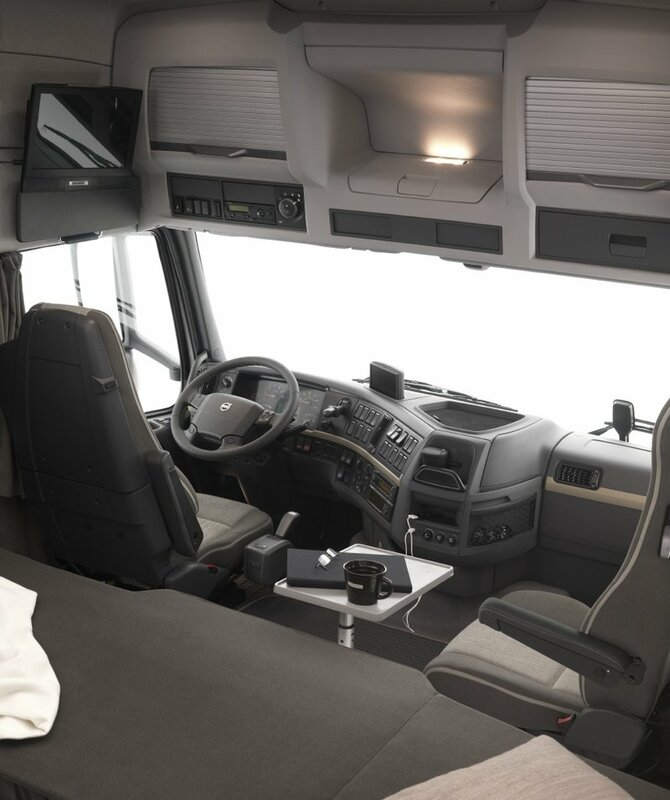 The front driving space is standard for the cab over engine configuration, with a great road visibility combined with adjustable air suspended captain chairs. The passenger seat is designed to swivel 90° when the engine is off, to offer a better view to the flat-screen TV mounted above the driver’s seat. All the controls and switches are intuitively placed and the gear lever and handbrake also come easy into hand. Moreover, we also like the robust design of the steering wheel and it’s dimensions are perfectly chose making it easy to hold. Even if you won’t choose the most spacious cabin in the FH range (Globe Trotter XL Cab) , the truck still offers plenty of room and a plethora of storage places including an under bunk fridge and a few useful boxes above the windscreen. Thanks to the last facelift, the sleeper cabs have received a wider bed which is fairly comfortable and it’s also reclinable offering a higher degree of versatility. For the FH range, Volvo also offers rain sensors for the windscreen wipers. The sensors monitor when, and how much, rain is falling and the windscreen wipers are automatically adjusted to suit. Lastly the cabin is fitted with a powerful audio system with the possibility for USB, AUX, MP3 and TV inputs. The Volvo FH is equipped with a host of powerful Swedish engines ranging from 420 to 540 hp. Thanks to their top notch build quality, these engines are among the smoothest and balanced units in the 44 tonnes segment. Regardless of which engine you’ll choose, the truck will climb hills without breaking a sweat even when it’s fully loaded at 44 tonnes. The really good part is that thanks to the capable automatic transmissions, it will also do it with maximum fuel efficiency. For the FH range, there is a choice of three gearboxes including I-Shift, Manual and Powertronic. All three gearboxes are smooth and precise with well chosen ratios. The automatic transmissions work perfectly in sync with the engine and always keep the momentum at best by choosing the optimum gear in order to offer maximum performances and low fuel consumption. The Ecoroll function is also there to increase the efficiency by disconnecting the main shaft in the gearbox when on flat. You can use the Volvo engine brake (VEB) by means of a stalk mounted on the right of the steering column which offers four set positions assuring the optimum stopping power for any moment. While you are driving you are assisted by Volvo’s and Land Keeping Support (LKS), VEB and cruise control systems which make a great job in keeping the truck in check. Thanks to all these high tech nannies the truck can cruise all day long with most of the incidents kept under control. The Volvo FH is available with a wide range of chassis configurations including 4×2, 6×2, 6×4, 8×2 and 8×4 models combined with heavy duty suspensions. The Electronically Controlled Suspension can automatically adjust itself to assure that the truck remains at a constant height and compensates for unevenly distributed loads. There is also a manual height control to adjust the load platform’s height to match that of the cargo bay. 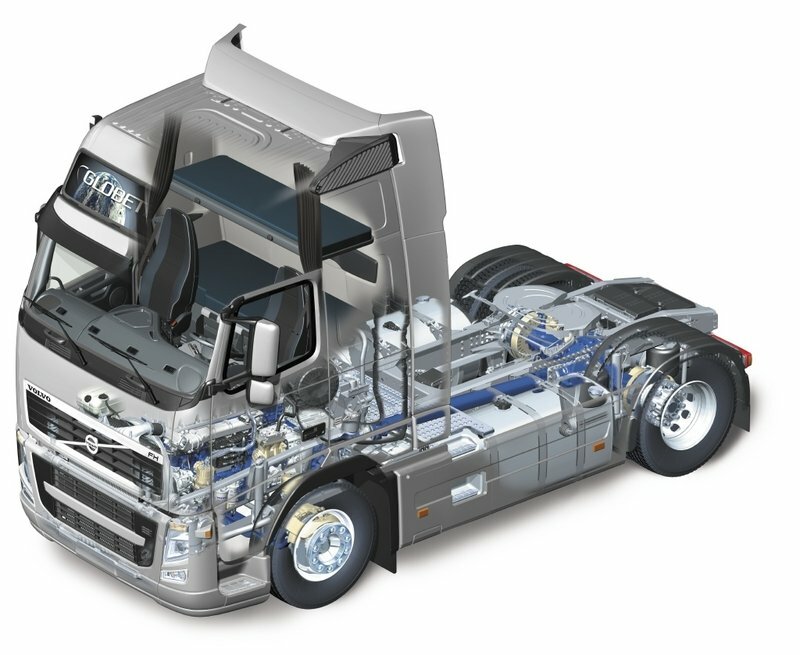 The Volvo FH can be also suited with leaf springs of parabolic or conventional type. The suspension setup is pretty pliant and combined with the air suspended seats the ride is comfortable. You’ll also like the sharp steering which offers a precise feel and moves the huge wheel effortlessly. 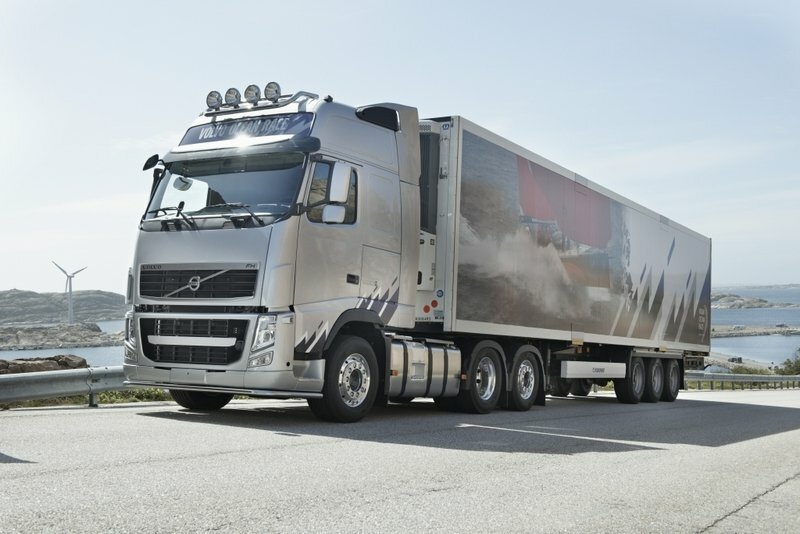 As a fleet truck the Volvo FH makes a compelling case for itself. Thanks to its comfortable and modern cabin is also a nice “work-place on wheels” being equipped with a lot of premium features to make the driver feel like home. There is available a wide range of cab and chassis configurations, thus being able to serve for a lot of duties. We also loved the engines as there are among the most refined units in the segment. The transmissions aren’t bad either and cope well with the duties of a heavy duty truck. Moreover, the Volvo FH is also equipped with a lot of safety features and thanks to its strong build quality is among the most reliable trucks on the market.